François Spitz is in the Department of Developmental and Stem Cell Biology, Institut Pasteur and CNRS UMR3738, Paris 75015, France. Mammals can discriminate between a vast number of volatile compounds — perhaps more than a trillion1. This extraordinary capacity is encoded by a repertoire of hundreds of olfactory-receptor genes, distributed in small groups that are present on almost all chromosomes2. To ensure that the response to individual odours is specific, each olfactory sensory neuron (OSN) expresses a single, randomly selected olfactory-receptor gene. Writing in Nature, Monahan et al.3 show that, in the nuclei of mouse OSNs, certain regions of multiple chromosomes assemble in a structure that controls the expression of the full repertoire of olfactory-receptor genes in the nose, while making sure that each cell expresses only one type of receptor. These exciting findings show that interchromosomal interactions can have a determinant role in regulating gene expression. The expression of vertebrate genes is regulated by activating genomic elements called enhancers. Enhancers can be located far from the genes themselves4, but they are typically present on the same chromosome as the gene they regulate (cis interactions). These regulatory interactions are mediated by transcription factors, assisted by other proteins, and require the participating proteins and DNA elements to be closely connected in the nucleus. 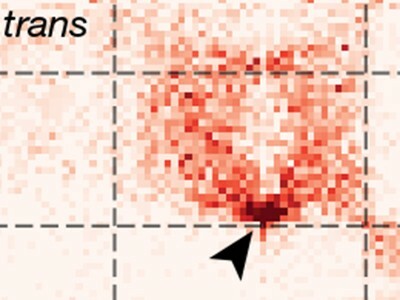 Molecular techniques, such as Hi-C5, that capture the 3D folding of chromatin (DNA and associated proteins) have revealed that the interactions between genes and their enhancers occur in compact structures called topologically associating domains (TADs) that organize chromosomes into distinct cis neighbourhoods6. Hi-C analyses have also uncovered specific interactions between genes and genomic elements located much farther away from each other, in different TADs and even on different chromosomes (these are called trans interactions)7,8. These observations raised the possibility that trans interactions influence gene expression. However, because the frequency of trans interactions is so much lower than that of cis interactions, their functional relevance has remained debatable. Olfactory-receptor genes were reported to form interchromosomal clusters more than a decade ago9. But the role of these clusters was unclear because deletion of potential trans enhancers affected only the expression of olfactory genes on the same chromosome10. Recently, researchers from the same group as Monahan et al. identified 63 potential olfactory-receptor-gene enhancers — which they named Greek islands — distributed across 16 of the 20 chromosomes of mice11,12. In the current paper, Monahan and colleagues provide a comprehensive and functional high-resolution analysis of the 3D organization of olfactory-receptor-gene clusters and Greek islands during the differentiation of mouse OSNs. The authors used Hi-C to analyse the structural conformation of chromosomes in mature OSNs, the immediate progenitors of OSNs and the stem cells that give rise to these neurons. They observed interactions between olfactory-receptor-gene clusters from different chromosomes in OSNs and their immediate progenitors, but these interactions were nearly absent in stem cells (Fig. 1). The interactions involved the entire gene clusters, and probably correspond to the aggregation of olfactory-receptor genes in an area of dense chromatin (heterochromatin) that has been seen using microscopy13. This type of chromatin is associated with repressed gene expression, and probably helps to prevent the expression of more than one olfactory-receptor gene in each OSN. Monahan and colleagues also report the presence of strong and focal reciprocal cis and trans interactions between Greek islands in mature OSNs. They go on to show, using cells from transgenic mice, that the Greek-island hub includes the active olfactory-receptor gene expressed in these particular OSNs, but not the other, silenced olfactory-receptor genes. 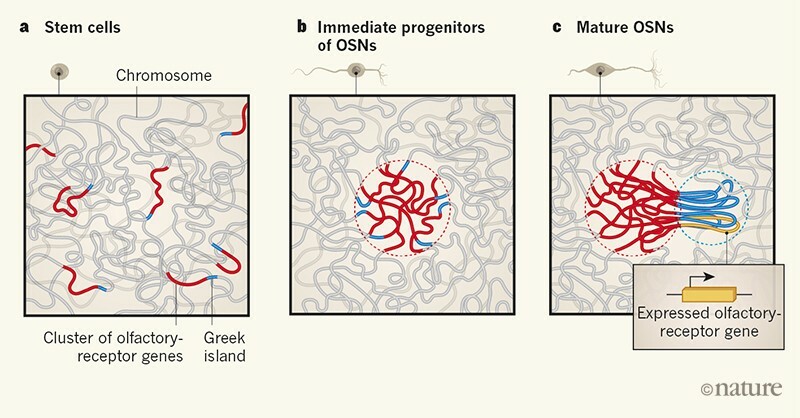 They propose that the aggregation of olfactory-receptor genes in a ‘compartment’ of heterochromatin brings the Greek islands from different chromosomes together, and that this proximity favours their subsequent assembly into an active Greek-island hub that is separated from the repressive environment of the olfactory-receptor-gene aggregate. Deletion of the gene that encodes the protein LHX2, a transcription factor bound to Greek islands, or of the gene that encodes LDB1, a co-factor of LHX2, strongly reduced interactions between Greek islands and led to the loss of olfactory-receptor-gene expression. The authors conclude that these factors are key actors in the formation of the interchromosomal structure they identified. Remarkably, Greek islands seem to act primarily as structural organizers throughout this biological process, folding chromosomes into specific repressive and activating structures, and guiding olfactory genes to these structures. Indeed, they might work as textbook enhancers that activate the transcriptional machinery at the start sites of gene transcription only in the final step of selection and activation of olfactory-receptor genes, by keeping the selected olfactory-receptor gene robustly expressed. But why would olfactory-receptor genes require such a large number of elements to regulate their expression, whereas most other genes need only a few? One possibility is that the transition of olfactory-receptor genes from a repressed, heterochromatic state to an active state requires many LHX2 binding sites to ensure that enough chromatin-remodelling proteins, which are necessary for this transition, are recruited. Alternatively, the use of ‘weak’ enhancers that only function as activators collectively might limit the possibility that more than one olfactory-receptor gene is expressed in a cell, and also avoid favouring the expression of olfactory-receptor genes close to ‘strong’ enhancers. The principle underlying this mechanism would be similar to the use of transcription-factor binding sites that have low or modest affinity at enhancers to achieve specificity of gene expression14. Monahan and colleagues’ findings emphasize the diversity of ways in which genomic elements can influence gene expression, and call attention to the limits and biases of the current assays used to identify and characterize such elements. They further highlight the role of 3D chromatin assemblies in gene regulation. The discovered trans-chromosomal hub might be similar to a TAD in the way it creates a local activating neighbourhood, but it is assembled by a distinct mechanism. It remains unclear whether interchromosomal interactions similar to those displayed by olfactory-receptor genes in OSNs occur frequently between other genomic regions in other cell types, although trans interactions have been reported in a few other cases of stochastic regulation of gene expression15,16. Interchromosomal interactions might therefore be primarily a mechanism for generating diversity in a population of otherwise indistinguishable cells. Because their characteristic signatures are masked by cell-population averages, these cases are difficult to identify. The development and improvement of techniques for analysing gene expression and chromatin conformation in single cells might, in the near future, reveal new examples of 3D genomic structures and functional trans-regulatory interactions. Bushdid, C., Magnasco, M. O., Vosshall, L. B. & Keller, A. Science 343, 1370–1372 (2014). Rodriguez, I. Cell 155, 274–277 (2013). Monahan, K., Horta, A. & Lomvardas, S. Nature 565, 448–453 (2019). de Laat, W. & Duboule, D. Nature 502, 499–506 (2013). Dixon, J. R. et al. Nature 485, 376–380 (2012). Spitz, F. Semin. Cell Dev. Biol. 57, 57–67 (2016). Schoenfelder, S. et al. Nature Genet. 42, 53–61 (2010). Zhang, Y. et al. Nature 504, 306–310 (2013). Lomvardas, S. et al. Cell 126, 403–413 (2006). Fuss, S. H., Omura, M. & Mombaerts, P. Cell 130, 373–384 (2007). Markenscoff-Papadimitriou, E. et al. Cell 159, 543–557 (2014). Monahan, K. et al. eLife 6, e28620 (2017). Armelin-Correa, L. M., Gutiyama, L. M., Brandt, D. Y. C. & Malnic, B. Proc. Natl Acad. Sci. USA 111, 2782–2787 (2014). Crocker, J. et al. Cell 160, 191–203 (2015). Noordermeer, D. et al. Nature Cell Biol. 13, 944–951 (2011). Johnston, R. J. & Desplan, C. Science 343, 661–665 (2014).